The US Supreme Court is stacked with right-wing extremists – progressive voices for social justice entirely absent. Since the Court’s 1789 establishment, these words belie its rulings, arguments, “supreme” allegiance to power, and support for the divine right of capital. “We the people” are America’s privileged class, no others. The Constitution’s general welfare clause applies to them alone. In his book “Democracy for the Few,” Michael Parenti called the Supreme Court an “aristocratic branch” of government. Its members are appointed. They serve for life, and have great power for good or ill – too much of the latter, not enough of the former. Justices nearly always side with corporate America. Today they’re supremely pro-business, ideologically conservative and reactionary. No one nominated by Republicans or undemocratic Dems approaches the stature of William Brennan, William Douglas, Thurgood Marshall or Louis Brandeis. Five current Supreme Court justices are Federalist Society members – Chief Justice John Roberts, Samuel Alito, Anthony Kennedy, Clarence Thomas and Neil Gorsuch. The organization supports rolling back civil liberties, imperial wars, free-wheeling laissez-faire capitalism and corporatism, along with ending New Deal/Great Society social programs. It’s against reproductive choice, government regulations, labor rights, environmental protections and justice in defense of privilege. Jennings v. Rodriguez was argued before the High Court on November 30, 2016. On June 26, 2017, the court ordered the case reargued. Reargument took place on October 3, 2017. It involves whether government authorities can indefinitely detain immigrants, refugees and asylum seekers (including individuals with permanent legal status), along with whether they’re entitled to bond hearings at six-month intervals while appealing their case. Representing Alejandro Rodriguez et al, the ACLU argued that congressional statutes don’t authorize prolonged detention -that without periodic bond hearings, individuals would be unjustly deprived of their liberty. The Ninth Circuit Court of Appeals ruled on their behalf, ordering individual bond hearings at six-month intervals to decide whether prolonged detention without due process is justified. Indefinite detention of undocumented immigrants costs over $2 billion annually, an unacceptable abuse of power. “(N)o one should be locked up for months or years without a hearing to determine if their detention is even justified,” the ACLU argued. 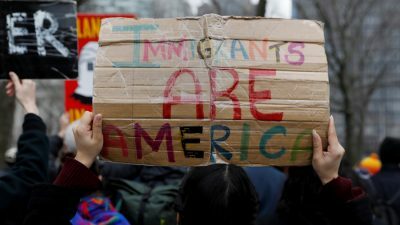 US immigration policy is notoriously discriminatory, mostly harming people of color and Muslims. Detainees held under deplorable conditions, treated like criminals, denied fundamental human and civil rights because they’re unwanted – including refugees and asylum seekers fleeing conflict zones or homeland repression. On Tuesday, the High Court ruled 5 – 3 against Rodriguez et al – depriving them of due process and judicial fairness, hallmarks of all free societies, absent in America. Trump appointee Neil Gorsuch ruled with the majority. Elena Kagan recused herself. She was Obama administration solicitor general when it supported indefinite detention of immigrants. Tuesday’s ruling affects hundreds of thousands of indefinitely detained immigrants, refugees ad asylum seekers – countless numbers of others in America vulnerable to arrest and similar oppressive treatment. Most media scoundrels paid scant attention to the ruling. The NYT initially published an AP wire service report, not its own until Wednesday. The Washington Post covered it. So did the Wall Street Journal. CNN, MSNBC, and NBC news ignored it. So did most congressional members – including self-styled progressives in name only Bernie Sanders and Elizabeth Warren. Obama administration officials supported indefinite detention without habeas or due process rights. Tuesday’s ruling provided more evidence of the absence of equity and justice in America – police state harshness replacing it. The High Court remanded the case back to the Ninth Circuit for further consideration on whether immigrants, refugees and asylum seekers have any constitutional rights – clearly not in America today.